Grease has always been a terrifically entertaining film, but never in any past release for home video, has it ever attained pictorial, and aural perfection. For me, the track was always sonically crippled. For it’s 40th Anniversary – not certain why the studios have an anniversary fixation – Paramount has returned to the camera negative, and as far as I’m aware, accessed the 70mm mix for the first time for home theater use. And the results are beyond startling. Vocals and music are crisp, clear and proscenium filling. Colors pop, with blacks being truly black, while a very fine sheen of grain, keeps the image in play. HDR has been delicately applied. The difference between this new 4k release, and any of the older Blu-rays is so immense, that it leaves everything else in the dust. Grease, in 4k, will be one of the reference discs of the year. So glad to hear a positive review of the audio! That was my biggest question on this one. Seeing Olivia Newton-John in 4K is another good reason to buy this. I was going to skip this, but now…. "A Few Words…" posts always cost me a few dollars! Oh, it's Olivia Newton-John. All these years I had thought of her as being Olivia Newton-Travolta. What a welcome review (especially in terms of the audio). Would you suppose they use the same transfer for the new standard Blu release? Actually, seeing 4K – in and of itself – is another good reason to buy 4K. Darn this review. Thought I'd squeak through this life without ever having to see "Grease" more than once. Very glad to hear of the improvements in video and audio. I was on the fence about upgrading but no more. I am counting on it – will be disappointed if not. Great news – looking forward to this one. If by No DNR you mean "No DNR beyond that which is considered an acceptable level considering the quality of the source or lack thereof"… probably. Because there's no such thing as a transfer without DNR. Not sure about that. I thought none was used on Godfather. RAH? Sure there is. Don' tell me all the Sony UHDs from camera negative are grain managed. I'm seeing the fathom event for this movie tomorrow. Hopefully they used the same transfer and sound mix. No one brought it up yet, but the "blurred Coke signs" are gone – sort of. One still exists in the background of a shot, but that's the only evidence of Coke. Another Coke image just gets deleted, while other Coke signs are now Pepsi signs! I would have rather they just left it the way it was, given that the crude alterations were part of the original prints. This solution might seem sleeker, but it still reeks of revisionism. I guess. This seems like something along the lines with removing the reflection of the snake in "Raiders of the Lost Ark" to me, though – fixing something that technology couldn't correct at the time. It remains unclear to me whether or not the film ever ran with the Coke signs intact. Many people claim it didn't, but I found this picture. I can't remember that scene (if the Coke ad was on the wall)…but I seem to remember a huge Coke sign behind the bleachers at the school (maybe during the Summer Nights sequence?). I haven't kept up with this discussion about home video releases of Grease (and Coke signage). I'm certainly no expert – I did an Internet search while I wrote my review. The consensus seems to be that the producers had a deal with Pepsi and altered the Coke signs to honor that – though they still let one slip through. Others claim that Coke wouldn't give the producers permission to show the Coke signs – rather than reshoot the scenes, they blurred them via pre-digital technology. Many claim the changes were made before the movie ever hit screens in 1978, others say they didn't happen until the movie came out on video. According to Kleiser, producer Allan Carr made a product placement deal with Pepsi but the set decorator never got notified. The disconnect didn't come to light until Carr started seeing Coke products in the dailies. They were forced to use crude optical printing techniques to hide the Coke references. My guess is that this happened after the film was color-timed, which is why that unblurred shot from Technicolor exists. They couldn't come up with a method to hide the Coke cooler that wouldn't significantly detract from the scene, so they left it in and hoped that Pepsi wouldn't notice it (they didn't). Today's fathom event was strange. There was no Fathom pre-show, I was about to go downstairs to complain that something was wrong when the maskings suddenly opened and the movie started playing. There were no TCM host segments before or after the movie. The movie sounded great but the image could have been better. Not sure if it was a problem with the transfer or with the projector. The "Coke" signs were Pepsi signs. There were no TCM host segments before or after the movie. I was at a showing of I Can Only Imagine in East Greenbush, tonight, Wayne. There was a trailer for the Grease Fathom Event and they sure made it look like there'd be some participation by Ben Mankiewicz. My guess would be that they had some trouble receiving the content from Fathom and obtained a DCP of the movie instead. I have always been disappointed in the audio/video quality of prior Grease home video releases. As others have said, RAH's review has now guaranteed I'm going to buy this on 4K. Excited to see how great it can look now that they've gone back to the OCN. I’m thrilled to hear that they finally are correcting the horrible audio and picture on this fun film. I never get tired of watching it even though the technical quality was the worst. Can’t wait for this! Thank you! Has there been confirmation that the new Blu-Ray will have the corrected (I.e. original) audio? This will be my first 4K title! "Tell me more, tell me more …"
Thank you for your review Robert and it help cement my purchase of this film on 4K UHD! I have never gotten around to buying this movie yet but I will be buying it on 4K UHD blu-ray. Again thank you Robert for another great review. Turns out they are also finally releasing Grease 2 on Blu Ray! The bummer is (well, aside from that it’s Grease 2) that it’s only going to be available as part of at “Grease Collection” that includes the first film and the live TV version. In a perfect world, I’d pick up the 4k Grease and the standalone Grease 2. In a more perfect world, I’d pick up 4k versions of Grease and Grease 2. In this world, however, I’ll either pass on both or pick up the Collection now and the 4k of Grease further down the road (not yet a 4k household, so would only get 4k now to future-resistant. I apologize for doubting. The phrase ‘99.9 sure’ made me think it was an informed opinion, instead of a confirmed fact. Also I tend to think of ‘transfer’ as referring to the picture, not the audio choices. I couldn’t tell if you’d seen or heard the actual Blu-Ray (RAH’s review was specifically of the 4K disc). Apparently you have. Hahahah!! I turned 11 that summer and the movie was a HUGE deal. Always dear to my heart. Turns out they are also finally releasing Grease 2 on Blu Ray! The bummer is (well, aside from that it's Grease 2) that it's only going to be available as part of at "Grease Collection" that includes the first film and the live TV version. In a perfect world, I'd pick up the 4k Grease and the standalone Grease 2. In a more perfect world, I'd pick up 4k versions of Grease and Grease 2. In this world, however, I'll either pass on both or pick up the Collection now and the 4k of Grease further down the road (not yet a 4k household, so would only get 4k now to future-resistant. Grease 2 gets a separate BD release in Europe (Germany for example) so since I can't be bothered with the live version I'll pick that up down the line and won't bother with collection set. Just wondering if Paramount finally cleared the rights with Coke to show their vintage artwork during the scene where everyone meets at the malt shop. All previous home video releases have obscured the many classic Coca-cola background art using a clumsy traveling matte and/or filter that is so painfully obvious it makes those sequences look silly. Just clear the rights with the sponsor…please! Any word on this…apart from, you know, 'Grease' – which will always be the word! Replaced with digitally rotoscoped inserts of vintage Pepsi sign(s). I was getting a coffee, this morning. In walked a lady wearing a Pepsi jacket. It sparked my recall of these recent posts. And so it was that I walked up to her, as I was certain that she was a representative. I mean, truly, I simply could not resist, for then and there I asked of her, "Why is Pepsi still at war with Coke?" She smiled. And, to break the ice – so to speak – I added, "If you and Coke could only make peace, then maybe such a truce could lead to a greater world peace". She laughed. And I said, "Should I take that as being a Coke with a smile?". Give it a few weeks, but I think I've planted the thought within her – as she will certainly speak to her supervisor by 5:00 this afternoon – and soon our planet will be "in perfect harmony". And from there, without a doubt, we shall soon see that there will be no more tampering with any of our future transfers. I know your trying to be humorous but why would anyone wonder why Two competing companies selling the same thing would not be at war, as you put it? And you're right: I did say "99.9%" because I'm going by my observations, not a factual statement from Paramount or whatever. All I know is that I flipped between them and heard zero differences between the audio mixes. Wouldn't make much sense for Paramount to use the old mix on the new disc since they gave it a new picture transfer anyway, right? Not entirely. There's still one sign that's blurred, and IIRC, there's one Coke promo item that's just blank. Ignore the Amazon specs (most retailers in 99.9% of the cases just put what region they're located in than bother stating the correct region(s)), it's going to be the same disc worldwide. Paramount isn't in the habit of region locking. Here are the specs according to Bluray-disc.de and the plethora of audio dubs and subtitles includes the Japanese dub and subtitles and thusly Region A compatible. What revisions have been made to the soundtrack? My concern is that is that the audio is billed as "enhanced from a six-track mix created for an original 70mm release" which doesn't quite sound like it's the original sound mix. The sound was badly remixed in 1998 with dozens of mistakes and changes. So the question isn't if this new mix sounds good (clearly it does) but is it unaltered? Are there added background vocals, foley, etc.? I think that was intended as a joke. You click the youtube clip and get a heavy metal version of one of the songs. No comment on the Blue Shift in evident in the BD capture comparisons and in the extra filtering? I hope those don't apply to the UHD as well. Darn it, RAH. I was going to skip this release. Arrrrgh! You're killing my wallet! Now you've moved it up from a "must buy" to "why isn't this damn thing out already" for me. I rented the iTunes version today and I can gladly confirm the sound is definitely NOT based on the 1998 remix. It's a remix, but using the original 6 track 70mm dialogue/music/sound effects stems I'm guessing. No new foley or sound effects have been added, it's all the original tracks, flaws and all, The songs are the original mixes. The music edits are correct. The original Paramount logo and fanfare is there. The songs sound big and have the punch which was missing from the 1998 remix. This is evident from the start with the title song. Summer Nights doesn't have the weird added percussion. Hopelessly Devoted doesn't have the tacked on backing vocals or added percussion, No overly loud foley during the dance off. You're the One That I Want doesn't have added foley or out of sync backing vocals and the missing vocals at the end are there. I can detect some very slight differences in dialogue/music/sound effects balance (mainly louder ambient sounds), but nothing that took me out of the movie. It's as good and faithful of a mix as we could hope for. Overall a HUGE relief after 20 years of waiting. I won't comment on picture quality based on the iTunes version. The 4K disc is now in my Amazon basket. So basically you're telling me I have several new coasters, once I purchase this 4K disc. Some of the 1080p caps over at Blu-ray.com look like portions of the transfer have been DNR'd… or taken from some sort of inferior source. Sure hope the UHD disc isn't like that. Why would anyone reference screen caps @ 25% resolution? Meaningless to the discussion, especially if one uses as a poster child, (in one of the threads) an optical dupe. There are two ways, both correct, via which one can present a film as data. Release a scan that essentially plays the original negative, or slightly adapt that scan to appear more like a print, as the film would have been seen theatrically. To my eye, Grease appears more in the print category, with more velvety grain, as though it’s been through the IP / IN stage. Or if we include Grease Live!, all three. Why would anyone reference screen caps @ 25% resolution? Well, all 1080p captures from blurays are 25% resolution of a 4K scan but there are much better such screenshots out there from other blurays. we're not comparing here the bluray of Grease with the UHD of Grease, but the bluray of Grease with other Blurays coming from 4K scans. Wow, I guess all the people who have been complaining about the 1998 mix really knew what they were talking about! I was completely ignorant as to how drastically the soundtrack was compromised. Yes, that is drastic. I've never owned a version of Grease on home video but was contemplating getting the 4k version this time. That sound mix from 1998 compared with the new one is anemic. What an improvement! I wish I knew exactly how many times I saw Grease in the theater in the summer of '78. It was many. I'm never an expert on these things…but I always knew the various DVDs and Blu-ray versions over the years never sounded right. That is a very hopeful YT clip posted above by Dave. I'm neither a fan nor supporter of 4K. I owned a 35mm remix Dolby Digital print of Grease but we just didn't like the music in the remix so I sold it. Last year I was offered a 1999 reprint in 35mm with the original score and presented in Dolby "A" stereo. I very happy with the "film" look over the BD look. I do love my Blu Rays but 2K is good enough for me. I'm just an old school guy who enjoys the look of film on the big screen. There's plenty of room in this HT hobby for both Blu Ray and film. I'm envious, I'd love to see that print. It's kind of a sad thing that most new 35mm prints of classic films these days are made based on a digital color grade, not the original photochemical timing. I examined a 35mm print of Raiders of the Lost Ark recently that was made from the (IMO awful) revised blu-ray timing. It is a sad thing that that even if there is the rare chance to see a film projected on 35mm, you aren't guaranteed to see the original timing if it's a newer print. IIRC, it wasn't just LS playing one song – it was a semi-long tribute to the band. "Semi-long" meaning like… 10 minutes? Or maybe it just FELT like 10 minutes to an 11-year-old who didn't care about LS and who just wanted to see "Grease"! Anyway, I saw "Grease" multiple times in summer 1978 as well, so I sat through that LS tribute multiple times as well. You're not crazy – well, you might be, but your memory of the LS segment doesn't prove it! It definitely ran before "Grease"! Neither of you is crazy. Thanks, guys for confirming a dusty 40-year-old recollection. It's one of the reasons I have this particularly odd affection for Free Bird. For me, the summer of '78 was the summer after my first year at college so me and some of my high school gang spent a good chuck of the summer involving activities that often centered around showings of Grease. That clip is not what I would have said I saw…but I'll accept that that certainly must have been it. It WAS quite a while ago for this 59-year-old. For some reason I have this image of an animated bird taking flight during the musical introduction of the song and then a full-blown performance. But that's probably just the impact of time. I'm neither a fan nor supporter of 4K. But with 4K UHD disc I've found is as close to projecting a print as you can get. Especially Sony 4K discs. I, like you, thought standard 2K blu-ray was close enough. I was wrong. A projected 35mm release print is somewhere between 720p and 1080p, nowhere near 4K. Even projected 15/70 IMAX doesn't quite hit 4K. Not sure I agree with that, but it's more of a color & grain structure thing. It surprised me initially, as well, but there was a study some years ago that measured the resolution of 35mm film in theatrical presentation. The 4K system that most people know is IMAX — and it doesn't quite make 4K, which is a surprise to people. "How can that possibly be?," you say. "It's an enormous big frame." Well, because of what I was talking about earlier: the physics of optics. When you take the entire system into account – from the lens of the camera, to the the movement of the light through the projector, all slightly reducing resolution — you wind up with less than the full resolution you started with. A number of years ago some IMAX engineers – and I don't think IMAX ever let these guys out of their lab again — did this wonderfully elegant experiment at the Large Film Format Seminar at Universal Studios Imax theatre. They showed this film they made that began with 2 rows of 2 squares: black white, white black, as if you had 4 pixels on the screen. The screening I saw of this new restoration wasn't nearly as packed or as "interactive." But now, the film finally looks and sounds the way it was always supposed to. *By which I mean Battlefield Earth. Why, which ones did you think I meant? ***Disney had already given up on the regular theatrical release pattern by that point. My wife dragged me to this film (I was practically kicking and screaming) in 1978. I was absolutely convinced I would hate it. How much do I hate it? I'm going to SHRED my 1998 Blu-ray! I thought it looked terribly soft when I saw it theatrically. The iPhone lacks dynamic range and color depth, which is more important than 4K resolution in making a cinematic image. The trailer demonstrates that along with the limitations of the built in lens. It's interesting and could work with a good story, but I don't see the iPhone replacing 35mm any time soon ;-). Yeah there's obviously a bit of hyperbole there. Just like in music production. A full Pro Tools rig costing tens of thousands of dollars manned by a team of professionals will turn out studio-quality albums. But nowadays someone with a decent Mac and Logic Pro X ($200) can do quite well by him/herself. So yes, the 35mm, IMAX, Arri Alexa, et. al. don't have anything to worry about in terms of competition from the iPhone X (or XI or XII) in the pro market, but what the iPhone can do for a small-time filmmaker is similar to what Logic Pro X can do for an amateur musician. Get you very professional looking/sounding results for a minute fraction of the cost. And Allan Carr, who never followed up on the success of it with anything as good or better, would not be around much longer. Just heard from one of the most trusted posters at bluray.com that this has been severely DNR'd to remove grain. What a shame. In terms of effective resolution, a good 35mm print is a little shy of 1080p. But that doesn't tell the whole story, because enlarging analog doesn't have the same issues as enlarging digital. Analog enlarged too much just looks soft. You enlarge digital too much, and you start seeing pixels. As previously noted, the individual(s) in charge of the project can create an end result to have grain seen in an OCN, an IP, or something else. I had no problem with Grease. I might not have noticed it happen while watching the 40th Anniversary Blu. But now that I've seen it, I can't unsee it. Robert (or someone), please check the actual 4K disc to see if it's still there. Perhaps Paramount caught it and fixed it before the new discs got pressed? Beyond that, the color timing of those two versions is AMAZINGLY different. I wonder which one is most loyal to the original appearance? Can you explain for the unenlightened? Robert, I don't own the 4K disc yet but the time code should be similar to the time that Mark-P reported, 1:43:42. It's the scene when Sandy and Danny are dancing up the funhouse zigzag walkway. They reach the very top level and the camera zooms in on them as they each spin around. They actually spin twice while up there it's the first spin that has the error. It occurs at the 24-25 second mark in the YouTube video I linked in my original message. It’s there, but one has to look for it. Error by digital cleanup entity. Error by digital cleanup entity QC people. Error by Paramount QC people. It happens, but should not. Looks like when a colorist on a comic book over colors and it goes across to a space that isn’t supposed to have that color. Also all the color in that is different and more colorful compared to the earlier release. Did they add more color and smudged it onto his head? It's from the little known, ill-advised Grease Special Edition. Not only did they badly remix the sound, they had Danny wear CGI Braveheart style warpaint. They also changed the hall monitors' guns to walkie talkies. It looks like a digital color correction error. They were coloring the panel behind Danny and made a mistake. They masked off the panel and when his face passed in front it was colored as well. The color of his skin is pretty close to the color of the panel in the blu-ray version, that's probably why it happened. That seems to indicate they were changing rather than enhancing the original color. Auto clean-up of some sort, not distinguishing shots. My people and I generally QC at 4-6 frames per second, with three people viewing. That seems to indicate they were changing rather than enhancing the original color. The sound seems a lot different in that clip too. The entire song is included on the 1982 RCA Stereo Demo Disc (the failed CED format) and I've watched that disc literally hundreds of times. Vocals sound like a different recording. I'm not too crazy about the Pepsi replacements either, though technically that's a new version as it was shown that way digitally in theaters recently. The only reason I tolerated the 1998 version is because they had 35mm prints of that. It is my understanding that John Travolta arrived late for that particular shoot, claiming that he had a Close Encounter. They re-shot the scene after another application of make-up to cover it up. Historically, the first take was printed and circulated within the studio for government officials to assess. Once declassified, Take #1 was meant to be destroyed but, future archivists who saw its historical value switched it out within the vaults to save it for posterity. Years later, an apprentice doing inventory stumbled upon it, not knowing its significance and mixed it back in with the other elements that were earmarked for the first home release. I absolutely realize that this particular error is something that could be missed by QC. But, for me, the more important question is whether Paramount will do anything about it? Will they take the time to fix it and issue replacement discs? Now that I've seen it, my brain can't unsee it. Hello, first time poster here so apologies if this is long. Anyways just wanted to say I am excited for this release. I was not around yet when the film first came out so like many of my favorite films I grew up with this film via VHS. Additionally it was a pre-1998 VHS so although it was P&S it showed the theatrical film. Discovering later that the film was rereleased with a new audio mix for its 20th Anniversary is cool as it allowed the newer and older generation to rediscover the film but had many downfalls for purists like myself. The original Paramount logos with the original fanfare which IMO segued perfectly into the opening scene was gone and of course the many issues with the remix which I don’t even think I have to mention since they’re pretty well known at this stage. When I heard of this 40th Anniversary release, I like some was skeptical. I figured it would be based off of the 20th Anniversary version. Even after seeing the new trailer I had concerns that maybe the current Paramount logo would take the place of the ‘98 logo which had replaced the original. As far as the audio was concerned, yes I had doubts it would be closer to the original especially when the the press released said it was ‘enhanced’ from the original six track. After checking out the iTunes version a few weeks ago, I quickly discovered I needn’t to worry. Most of my concerns were not present in this release. The old Paramount logos with the original fanfare were back as well as the films original mix, or at least something damn near close to it. Yes I do have mixed feelings about the CGI’d Pepsi posters. As a purist I would have left the original opticals in or removed them all together but I suppose that’s wishful thinking. Furthermore it doesn’t appear they did this from scratch as in used the ON for this sequence. The matting effects are still present around Olivia and Lorenzo’s heads suggesting they CGI’d the posters over the opticals. And yes the pink spill on John’s face in YTOTIW is odd although it didn’t take until someone pointed it out for me to notice it. However, most of these ‘issues’ if you wanna call them that I can live with. Their not too distracting. At least the Pepsi posters are period correct and it beats watching a fuzzy optical that you have to admit is gonna stick out more and more like a sore thumb the more television and video formats keep improving. Don't get me wrong, I'm buying the 4K release, despite its flaws. But I still think Paramount should fix those flaws and announce a disc swap. I'd leave it as is. Expense vs. reward doesn't seem viable. The purist in me would like a fix and replace. The realist in me, who knows that corporations will always weigh cost of doing X versus revenue/goodwill gained, understands that the chance of this happening is slim-to-none. This is something that I would guess the majority of people purchasing this title won't even notice. And of the small percentage who do notice, the percentage of those who would be bothered/upset enough to demand a replacement would be so small that it wouldn't be in Paramount's interest (financially speaking) to undertake a fix-and-replace. I dunno…. Disney replaced the old "Pinocchio" Blu because it was missing one word of dialogue. If the errors in Grease are significant, they should at least offer a replacement disc for those few of us who will notice. I’m not arguing they shouldn’t. Just trying to set our expectations based on the calculations most companies go through before deciding on implementing a recall or replacement program. It's not a different recording or take of the song, but it is a slightly different mix, based on the 6 track Dolby Mix. Aside from slightly louder background vocals it's very, very similar to the original 35mm mix but with better separation and fidelity. It sounds great on a good sound system with a subwoofer. Well, I picked up a copy of 'Grease' 4K at Target today. It's currently on sale for $19.99 and also currently on Target's Cartwheel app for 15% off. After an additional 5% off for using RedCard the price was $16.14 plus tax. Score! And a day early, to boot! Super happy to see the deal in the WRU is legit, Mark. And, like Mike said, a day early! I'm in for that price, though I may need to wait til tomorrow night…aka actual release day. Just tested out the 4K disc and the audio sounds great but I couldnt help but wonder why whenever there was movement it would make faces look waxy / smeary. I noticed it when the principal Eve Arden and Mary Hartman’s mom Dody Goodman were talking. I know the difference between lense softness and this wasnt that affect. While the colors look bright and the image “clean” looking. I dont know It just doesnt seem right. Paramount will probably make a lot of money from this release and the Grease collection steelbook. No luck at my local target. Woman wouldn’t look in the back. No we don’t have them in the back, someone probably picked the two that are supposed to be here and put them somewhere else. Target's website shows the street date as March 12, which I guess explains why I could purchase it a day early. My wife and I just finished watching the entire film. The audio is FANTASTIC. Most definitely a HUGE improvement over the previous standard Blu-ray release (and, I'm sure, ALL previous home video versions). Among the various forums I've read complaints about lack of grain, waxy faces, etc. To my eyes, the concerns are overblown. This release looks excellent. Is it perfect? No. But it's EASILY the best it has ever looked on home video. Even though grain has been tamed a bit more than it probably should have been, the result is NOT a bunch of smoothed-over lifeless faces. Only here and there do faces lack some texture. The VAST majority of the time everything looks quite excellent. There are some soft scenes here and there but I'm pretty sure those are due to the original opticals. Color and saturation are outstanding. The color really pops. We have a Sony 940E which now has Dolby Vision. But we don't have a Dolby Vision 4K Blu-ray player yet (later this year). So we watched the entire film in standard HDR. I felt the balance of bright and dark areas was very natural without calling attention to itself. But, in regular HDR, the 4K Blu-ray doesn't have much HDR "pop". Thankfully, the digital code redeemed in iTunes as 4K and, after we watched the entire 4K Blu-ray, I switched over to the iTunes copy via my Apple TV 4K. That gave us the Dolby Vision presentation and we watched about 20 minutes worth of various scenes. The Dolby Vision presentation absolutely has more pop to it. After comparing the two, frankly, I think I actually prefer the standard HDR. The Dolby Vision HDR really called attention to itself by comparison. It seemed unnatural to a certain extent. Perhaps if I hadn't watched the standard HDR first I might feel differently? As for the Danny's painted forehead glitch, yep, my eyes went right to it and it was absolutely noticeable as a flash of color in that area of the screen. Shame on Paramount! They should fix it and offer free replacements. Even at $24.99 this title is well worth your money. If you love the film you are likely to love this release. Granted, it's not quite as good as it *could* have been but it is a FAR cry from being trash. If this release is a 9 the previous Blu-ray is a 1. Yes, it's that much better. If one half-second color correction glitch is the only significant problem, I can live with it. Maybe they won't do a disc swap as they did on Star Trek II, but perhaps the fix can be applied to the digital copy included with the disc. Cool beans. I’ve been checking my iTunes copy of Grease every day and today it finally bumped up to 4K. It still amazes me that Apple gives away free 4K upgrades, without making you re-buy the title. I went to the nearest Target store this morning hoping to nab this deal, but it wasn't to be. The store had no 4K discs on the shelf, the price was still listed as $24.99 in the empty spot where the discs should have been, and there was no cell coverage in the store, so the Target app wouldn't display the cartwheel discount. Three strikes and I was out — and placed an order via Amazon in the store's parking lot (their price dropped to $19.99). According to what I was told, many (most? all?) Target stores put their product out on the shelves on Friday or Saturday. There were multiple reports in forums from people that found the 4K version in their Target over the weekend. I let my fingers do the walking. I called my closest Target store on Sunday and they weren't able to find any copies in the store, despite the Target website showing they had stock. That store called other stores and didn't have any luck either. I picked a rather busy (but farther away) Target store yesterday morning and gave them a call too. Bingo, they had one copy left. The deal is real, the product is/was definitely in Target stores. The problem is the product got put out ahead of street date and many (most?) copies got snatched up early. Also, for those not in a hurry… prior to me actually finding a copy in a store, a supervisor at the very first Target store I called suggested I go ahead and order it from Target's website and, once it arrives, bring it to her store and she'd do a price adjustment for the Cartwheel discount. Cartwheel is for in-store only, the only way to get that 15% is by buying it in the store. She was willing to make an adjustment because the Cartwheel deal is an advertisement. An ad for product they didn't have. Others' Target store supervisors may be willing to do the same thing. All ya gotta do is ask. I don't often buy discs from Target, but in the rare instances I do, I have used their website + store pickup to let them do the work, and I just arrive at Customer Service. I don't often buy discs from Amazon, but in the rare instances I do, I have used their website + store pickup to let them do the work, and I just arrive at Customer Service. I checked the app last night and a fairly close store had it in stock. Swung by, grabbed it (there were two on the shelf) and walked out for $18.61 with tax. I won't get to watch for at least 3 weeks, but Grease is now sitting on the shelf waiting for me. Corrected – I meant Target. Was replying to the two posts above me. but Grease is now sitting on the shelf waiting for me. I had preordered mine from Target last Wednesday and they only shipped it yesterday and not to mention delayed the order twice. I ordered another on Sunday from Walmart and it shipped yesterday plus it was cheaper than the Target one. So when the Target one arrives I’m just gonna return it. Target has it in store for $16. What’s it going for at Walmart? Thanks. However, after this morning's experience, I probably won't be heading to Target for discs anytime soon. Not only that but they also have price checkers all over the store. The shelf tag is likely $25 in all stores this appears to be an unadvertised deal. $17 out the door for me. I'm going there on Friday night. If I get to speak with him I'll tell him that I know you! I thought it looked and sounded fantastic, just my initial impressions. No, it's no RAH-restoration scanned at 8K then downrezzed to 4K, but it's easily the best the film has ever looked and sounded on home video. Unfortunately they left in the mistake at 1:43:43, but it looks and sounds as it should. It only took 40 years but they finally got it right. It is pretty soft throughout but it’s probably very true to the original negative without edge enhancing. While it is definitely the best it has looked on home video, there is quite a bit of "grain management" going on in some places. It's not consistent, but it's there in varying levels, and that is a bit disappointing. Especially since many scenes look fantastic. Add that to the soft photography in places and you get some waxy faces in a few shots. 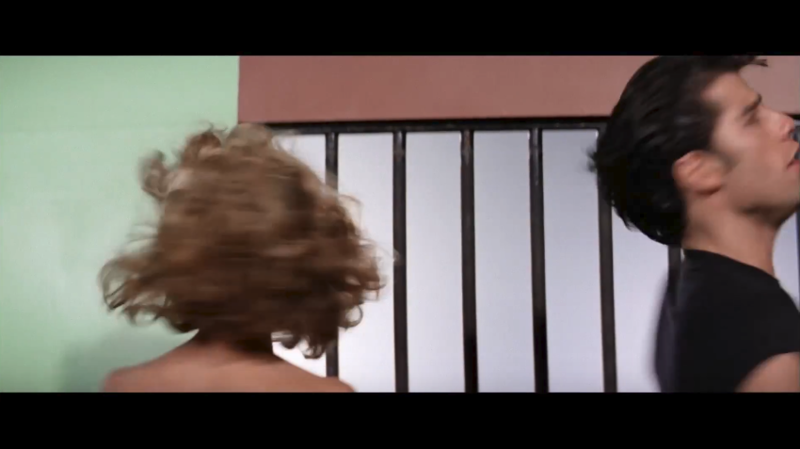 The new blu of Grease 2 has a surprisingly natural, unprocessed look with a nice sheen of grain. Grease should have consistently gotten the same treatment. Overall it's still a very nice looking transfer, I just wish the DNR had been lighter in some places. The colors in Dolby Vision are excellent and very true to the original film IMO. The blu-ray is a bit too bright and hot. The restored sound is a revelation, with great dynamics and a huge soundstage. It's a real treat and a welcome improvement over the dismal 1998 remix. The DNR on the cover makes it look like a comic book. That's not "DNR", it's a stylistic choice for the artwork. Pretty sure Mike was being facetious. I finally had a chance to watch this tonight – 110" projected. IMHO a big improvement over the previous blu, especially the sound. That being said, the sound seems a bit bright and while the color is gorgeous it does not look like film to my eye. Pretty, but not like film. IMHO. Caved and bought this at Target since it was cheap, and found another bit of revisionism- the jukebox in the diner, where the boom mic was reflected, has been CG'd over so the reflection doesn't show. It looks painted in however. The new Pepsi signs still look CG'd also. I'll have to re-watch the first DVD release and compare the sound to see what's so bad about it, as I've enjoyed that mix for what it is. Aside from that and the newer Paramount logos, it's still truer to the original release than this is. There are also some Coke signs still left in the scene, but they are outside the acceptable depth of field so they were always blurry. I got my photo taken with Edd Byrnes, who was really nice. I really have nothing profound to add to all the posts made previously except WOW, what a huge improvement over previous home video releases, in the sound especially. I haven't watched Grease in years because the previous Blu-ray was so lousy. What a pleasure to revisit this fun film. I was checking the Sing-A-Long edition the other day in my Amazon account and the mic shadow on the jukebox was missing there. It might be missing from the Rockin’ Rydell edition as well. Not sure since I don’t have it. I do have the 2002 DVD and yes aside from the sound and Paramount logos it’s the unaltered film. Another change on the new release is a Coke cooler in the background not only has the Coke logo removed but the cooler itself has been changed from red to orange. I suppose the new Pepsi poster is an improvement over the blurred poster but IMO they’ve softened the edges of the people so much that they almost look like ghosts when they are in front of the poster. Did he lend you his comb? I'll still probably buy this disc later in the year when I think it will be cheaper, but I can hold off until then. That's true which was another reason I'm not in a rush. Breathless Livvy, the hottest 30 year-old in her high school senior class. Imagine being held back twelve times. To this day, I still get multiplying chills when she transforms. It happened for me again watching the 4K Blu-ray. Never gets old. I didn't ask, since I wouldn't have much use for it unless you count my beard. I surprised him by giving him a copy of a photo taken at his wedding to Asa Maynor. Roger Smith was the Best Man. Edd laughed out loud when he saw it. The negative obviously was reversed when the print was made. I am the exact opposite regarding Olivia Newton-John. I fell head over heels for her when Grease came out — I was in high school. Her eyes just light up whenever she smiles, and I think she has a lovely singing voice. Oddly, though, I never really listened to her music much over the years. I just have a greatest hits CD and the Grease soundtrack in my music collection. And how was sleeping on the couch, Scott? Guess what? I didn't buy that package. I must have forgot to do so as I checked today and only bought the 50s and 60s packages. Now I'm debating whether to buy the 4K from iTunes for $9.99 since I'm not a big fan of Grease. Note: A keen-eyed viewer has noted a digital anomaly, probably caused by auto-cleanup, that never should have made it through (hopefully) multiple layers of QC. There may be more. Collect the whole set! For it's 40th Anniversary – not certain why the studios have an anniversary fixation – Paramount has returned to the camera negative, and as far as I'm aware, accessed the 70mm mix for the first time for home theater use. First, now that you’ve reviewed Grease 4K, how bout an AFWA review of another 1978 film just released on HD Blu-ray, Thank God It’s Friday? Would love to read that. Now the main take. Now that I have The Grease Collection Blu, I plan to finish my Grease Compendium by adding this 4K version. I was hoping to catch Target’s $16.99 sale but looks like I missed out as prices are back up to $25. Side note: I loved the Grease Live Blu. 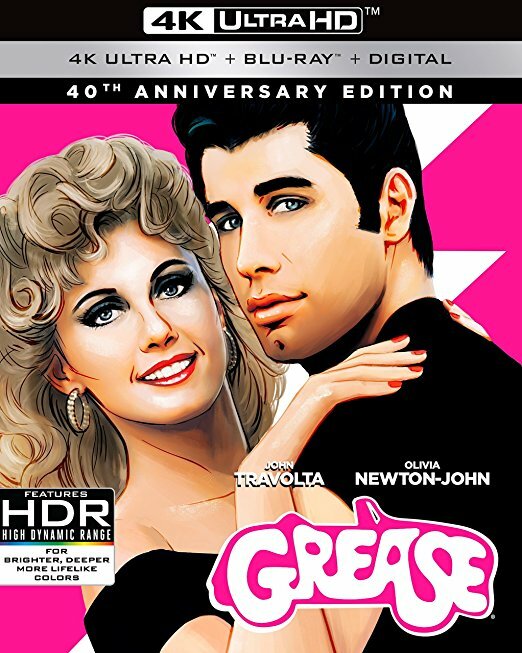 This is kinda special as the earlier 2009 Blu release of Grease was my first ever Blu-ray. Unfortunately Grease won’t be my first 4K Blu. That honor went to Ghostbusters 2016. But Grease is part of my early 4K upgrade program. Speaking of Thank God, It's Friday, my copy arrived today, and I hope to get to it sometime this week. There is a 2nd glitch just like the first, during the very next close shot. These should absolutely be fixed and a replacement offered for those who want one. Will you be offering an official review, Matt (of TGIF)? Just some thoughts on it once I've watched it. Not a real review. TGIF is from Mill Creek, so I wouldn't get my hopes up for much more than "watchable" in the quality area. Except for the fact that it is licensed FROM Sony which is very particular about how their masters are handled by licensees. I watched this in detail last night and is it just me thinking a lot of scenes look like SD DVD the image is so soft ?. Most of it looks very good but I'm not totally convinced having watched the 2009 original BD release many times. I checked out my copy yesterday. I was disappointed with the loss of detail/grain as a result of DNR. I am now thinking the red face error was always a part of the film. It looks like John got caught in a red gel fill light. In the next closeup, Olivia's hair does the same thing. Also, the face has more of an orange cast than the background. I disagree. You can see the red streaks in the old version as well. Here’s what I noticed checking the old Blu-ray. For whatever reason rhe colors on the walls were completely different colors between the long shots and closeups. The red above the window was red in the long shot but faded to skin color in the closeups. For the new edition they noticed this bad color continuity and decided to fix it by digitally painting the walls in the closeups to match the long shots and some of that digital paint got on Travolta’s face. A spectacularly good 4K release with Dolby Vision really adding to the pep rally and drive-in scenes – the ultra- black skies made these night scenes more realistic than I have ever seen before from a video or film presentation. This was my very first experience with 4K/HDR and those scenes (in particular) are how I "remember" (as subjective as that is) the movie looking back when I first saw it at the age of 11 in 1978! Good stuff! Completely agree about the chapters in musicals. And musical numbers should have a chapter stop at the END also; some players will allow a chapter playlist, but if the song chapter continues into the scene that doesn't work. I've watched the disc a couple of times (and some musical scenes more than that) and the audio is just outstanding! I do feel there was too much grain reduction in some scenes, but I was happy with the rest of the transfer. Well, I finally ended up buying the 4K/UHD release at Target for $16.14 as Cartwheel had a special on it combined with the usual 5% off. Also, I redeemed my digital code twice, once on Vudu and the second time on iTunes and both showed up as 4K/HDR. With the 40th anniversary of the film's release, I finally got around to watching it tonight. My setup still isn't 4k-capable, but — as was reported earlier in the thread — the Blu-Ray is a new downconvert of the 4K master, so other than resolution and HDR, all of the other benefits of this new release were readily apparent. Had a positive feeling right from the first frames, with the Gulf+Western 1978 Paramount logo restored to its rightful place at the beginning of the movie, rather than the late nineties/early 2000s Viacom Paramount logo. I damn near rejoiced when the cold open ended and the animated credits sequence was no longer windowboxed. The audio was astounding the whole way through. Felt like a silver screen musical again, instead of a low-rate karaoke bar. I like the color timing of this release better than than the late nineties version, too. Finally got around to buying & watch this week… Fantastic audio visual experience without a doubt one of the finest 4K UHD catalog releases to date. Looked absolutely flawless to me (I watched on the fantastic Panasonic THX UB900EB Player with very latest June 2018 V1.80 firmware on a LG Super Nano HDR Dolby Vision HDTV with the very latest firmware release). Amazing detail, wonderful restrained HDR & vibrant colours. Plenty of grain & variable detail in some scenes but it seemed like it was part of the original filming process if anything. The best compliment I can give this release is that it took me back in time 40 years to a wonderful place! My main reason for posting is I can confirm that digital red smear glitch is totally gone they must have fixed it silently as its not there anymore. The version I bought was shipped direct from the Sony DAC pressing plant in North London, England. So this means its from the latest batch made in the pressing plant as they ship the stock direct to you so it does not come from older stock sitting in a warehouse gathering dust. Here in the UK Universal Pictures & Sony have setup a website called Zoom which sells 4K UHD direct to the public & the discs are always shipped direct from Sony DAC (their name is all over the packaging). So if you want a corrected disc this is where to get it from! only £15 as well right now if you buy 2 UHDs from their special offer list but that special offer ends soon & you also gets an extra 10% off if its your first order! I must admit that I went into watching this transfer with high expectations and pre-conceived ideas about how it was going to look, so given all the praise from others, I do feel guilty that I'm either being unfairly critical or misguided! I'm not yet UHD equipped so can 'only' watch the bluray version, but I found that some of the color grading was so 'odd' at times (unnatural grass/foliage color, unnatural sky color, color saturation pushed to unnatural extremes, inconsistent colors between shots, blue push on some shots) that it kept on taking me out of the film, and sadly, I've come away disappointed. Some of the comments that I've read say that the UHD version has a more muted (I'm assuming acceptable) color palette than the Bluray, but wouldn't the Director/colorist have been able (and wanted) to achieve the same look for each? Does anyone know whether color grading is now done just once for the UHD version of a film, and for some color mapping software to automatically take care of the Bluray (in this case not as well as hoped for)? I do get the impression that with the advent of digital grading tools, there is more temptation to 'fiddle' and more risk of not getting things quite right. Or is grading an OCN scan much harder than that from a positive for some reason? I guess what I'm finding hard to understand is why, in many years of film watching through the photochemical timing era (which I'm assuming was quite a crude tool? ), I've never been taken out of a film by this kind of issue. Am I alone in seeing this kind of thing with some digitally graded films from this era, as here? FYI, Paramount has corrected the red band of color on Travolta's forehead in more recent pressing(s) of the 4K disc. I read about it on one of the forums (forget which) and contacted Paramount's Customer Service email last week. I received a replacement 4K disc today (just the bare disc in a disc envelope) and I have verified that the red band of color has been vanquished. I have also verified that the 4K digital copy version on iTunes still DOES contain the red band of color. Maybe Apple will get around to swapping the streaming versions eventually? Good questions, but I'm not sure of the answers. I closely compared the UHD BD to the remastered BD and found the UHD color to be much more preferable. I also found the gamma to be overblown on the BD and the HDR is done well and tastefully on the UHD. I just sent off an email to Paramount about a UHD replacement disc. Looking forward to re-watching Grease again already. I mentioned that above on 21st June! Just watched this twice thru as my first 4K showing on the new Vizio P75. And for comparison we had a full family & friends 4K viewing of Mamma Mia (2008). I was quite impressed with the 4K Grease but I did note those same soft spots that Panman40 noted. Double checked my connections to be sure but was definitely convinced after viewing MM2008 as MM2008 4K PQ was noticeably superior to the Grease 4K PQ. The 30 year gap in filming technologies between the two films might have something to do with it. All in all though I’d still recommend Grease in 4K though like a true dumb arse, I waited too long and ended up paying more for Grease in 4K. Next up, a theatrical viewing of Mamma Mia, Here We Go Again (2018) and Mission Impossible,Fallout (2018) film. Oh and finally some of my audience included some teen and pre-teen viewers of MM2008. You should have seen some of the expressions and heard the comments. (“too many songs”, “what, another song?”) One was a 12 y/o young fellow who likes Jeff Goldblum from his Ragnarok performance. I loaned him and family my Thank God It’s Friday (1978) Blu so he can see JG 40 years before Ragnarok. Received my replacement disc within a few days of sending off the email to Paramount. Very impressed with how fast it all happened. Should I be doing this replacement disc thing as well? If so, please someone repost here the link. Just five posts ago in this thread, Dave said he e-mailed Paramount directly. What is their e mail address? Their website doesn't have a contact us. I am in on a trip and don’t have access to my gear to check the discs myself. Anyone else wish to verify or debunk? The half-second little blip on the original disc doesn't bother me, so I don't think I'm going to do the exchange. I’m more concerned with the soft focus spots on the 4K disc. My slightly defective TV (Vizio 75 P Series) is being replaced this coming Tuesday (nothing to do with the focus) so I’ll be checking & tweaking some settings on the Sony X700 once I get home. Might still go for the replacement disc. I didn't even notice the blip when we watched the disc.